While brushing my teeth this morning, I turned around and realized Johnnie was not there. (She likes to read books and sort through the cabinets while I get ready in the mornings.) Then I saw something tiny peeking underneath the shower curtain. What are you doing, you little one-legged scamp? She has been climbing inside everything lately. Suitcases, laundry baskets, toy bins, underwear drawers... and apparently bathtubs too, if only she can get her leg up high enough. She is determined one. 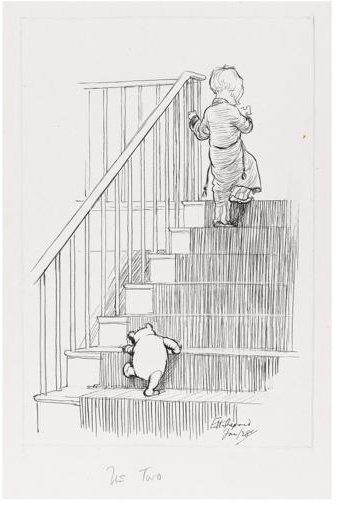 Drawing by EH Shepard, image found here.